This is a really great Jadeite Jade Square Flour Shaker with Original Lid made by Jeannette Glass. This Shaker measures 4 1/2 inches high to top of lid X 2 1/4 inches square. 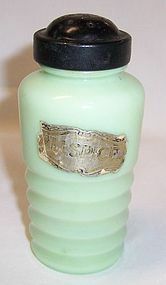 The Jadeite shaker is in very good condition with no chips or cracks. The Flour lettering is very good. The original metal lid is slightly dented, but usable. Be sure to search our other shaker available. We guarantee items to be as described. THANK YOU.